Project Services offers a variety of services ranging from general trade support for small projects to full planning, design and construction support for renovation projects under $2 million and full construction services for projects over $2 million. Project Services is comprised of three work groups that have an integral role in the successful completion of projects throughout Grounds: Planning and Business Management, Construction Management, and Trades Management. The Planning and Business Management group develops the construction cost estimates and assists with the creation of construction schedules for Project Services. Planning and Business Management provides service to both the academic and health system divisions on a variety of projects ranging from small office renovations to large research facilities. This group also has a production engineer whose core responsibilities include coordination of design efforts from A/E consultants, plan reviews, and production of small project plans which help to expedite designs for renovations. The Construction Management group is responsible for the development and administration of service contracts, and the coordination and execution of work. 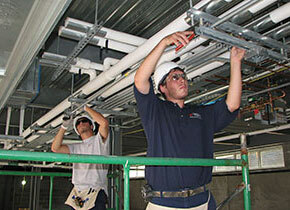 Construction Management uses both University trades and contracted services to perform needed projects and tasks. Typical projects include interior and exterior painting, pest control, carpet and insulation replacement, and renovations. The Trades Management group is comprised of highly trained trades people and is responsible for performing renovations and improvements. Services that the group performs include environmental remediation, carpentry, masonry, plaster repair, sheet metal, plumbing, electrical, cabinetry, sign design/fabrication, and moving/general services.